Not to be confused with Ashton Moss railway station. Ashton Moss is a tram stop on the East Manchester Line, built as part of Phase 3b of the Manchester Metrolink. The station opened on 9 October 2013, ahead of the originally-publicised schedule of the winter of 2013–14. The stop has an island platform, and is located on Lord Sheldon Way near the Ashton Moss leisure complex and Snipe Retail Park on Ashton New Road. The station is served by a 200 space Park + Ride car park, with electric vehicle parking facilities. Services are mostly every 12 minutes on all routes. 1 2 "Twitter / TamesideCouncil: CllrRobinson announces that...". Tameside Council. Twitter. 10 September 2013. Retrieved 11 September 2013. 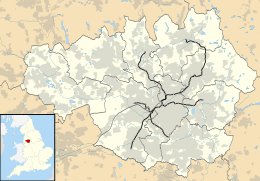 ↑ "Metrolink - East Manchester line". Transport for Greater Manchester. Retrieved 19 May 2013. ↑ "Metrolink - Ashton Moss station" (PDF). Transport for Greater Manchester. Retrieved 26 June 2011. Wikimedia Commons has media related to Ashton Moss Metrolink station.